In 2006, I traveled to the Greek island of Crete and was pulled to go to the Cave of Dikteon. Many caves on Crete claim to be “the birthplace of Zeus”, but my intuition told me the Cave of Dikteon had it, hands down. Rather than the birthplace of Zeus, I suspected it was something more akin to the birthplace of the Patriarchy—at least that phase of Patriarchy. Crete was one of the last matrilineal strongholds to be destroyed by the marauding tribes of men from the north, keen on a establishing a male-dominated society, where the Sacred Masculine would become the dominant power and rule over women and the Divine Feminine. Dikteon was 2.5 hours drive from my hotel and while navigating the twists and turns of the mountain roads, fear mounted. I began to remember that during my past-life on Crete I had been sent on a vision quest to the cave of Dikteon in order to take a reading on the encroachment of the Patriarchy. It must have taken me weeks to walk to the cave, through all sorts of terrain and weather, asking directions at the tiny villages whenever I came upon them. Will I be able to find the cave? Will I survive the journey alone? Will I be able to see whatever I need to see if I manage to get there? 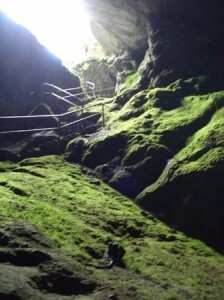 By the time I drove into the parking lot, bought a ticket, and entered the mouth of the cave, my heart was pounding. Miraculously, all of the tourists had cleared out only minutes before and I had Dikteon all to myself. Holding onto the handrail, I began my descent. Rhea is an ancient Greek goddess. She’s the mother of the first generation of Olympian gods, including Zeus, often referred to as the “Earth mother”, and strongly associated with Gaia. At the bottom of the cave, among stalactites and stalagmites, I seated myself in meditation next to the little spring. The hollow stillness of the cave was broken only by the soft drip, drip, drip of water into the pool. I connected to the Earth. Strong. Powerful. Sitting there in the womb of the Earth itself. “I need a spokesperson”. The words surged forth from the depths of the mountain. The Earth surely has many people who speak on her behalf, but, even so, the idea terrified me. I shot to my feet, raced up the stone stairs, and drove back to my hotel. Back to safety. Back to normality. Thinking of my reaction now, I have to laugh, but the power of the words, indeed the power of the Earth herself in that moment was completely visceral and overwhelming. Two weeks ago, when I recorded the audio for my recent YouTube, Reformatting Your Relationship with the Earth, I finished the editing at about 11:00 in the evening. I decided to listen to the recording one last time. I hit the play button, leaned back in my office chair, and closed my eyes. At the end, I opened my eyes and thought, “What have I done? People are going to think I’m predicting natural disasters in the future, that I’ve gone completely overboard!” I decided to sleep on it. The next morning, in mediation, I saw the reason for the reaction and felt good about releasing the YouTube. In the past few years, my work has been a 3-way circuit: Rama, my spiritual teacher in this and other lives along with his Lineage, the Sirian High Council, and myself, here, in embodiment. Now the circuit has 4 components. It includes the power of Earth that has been slowly coming online for the entire incarnation. Today, I reviewed the evolution of my relationship with the Earth. Even from the time I was a tiny child, I felt a special affinity for her, cradled by her golden, supra-conscious Light, bonded to her, protected by her. I thought about all of the hints I’ve been given through the years: the short story I channeled in 1995 where I spoke as the voice of Mother Earth, finding and transmitting the Ancient Templates of Wisdom to refurbish the limited design of human beings, the cave of Dikteon, the recent rash on my face that persisted for 8 months until I finally saw it related to my assumption that, for the Earth, her desecration is nothing more than a skin rash… All jigsaw pieces of a puzzle. Finally coming together. We are all OF the Earth, made up of the stuff of the Earth, born into this experiment in consciousness with every right to own the power of the Earth in our own bodies. We need ask no one’s permission to bond with the Earth, to stand fully in our power, and to walk upon her body as free and liberated souls. I’m working to fully open that access channel in my mediations in the next 2 days. And I’d like to assist you in taking a fresh look at your relationship to the Earth. If you would like to listen to the replay of the teleconference associated with this blog, Reformatting Your Relationship with the Earth, click here.